This patent pending, preformed, foldable, pond liner system is unique to the industry. The top of the pond has a collar that follows the contour of the bottom, which makes the collar lay flat on the ground surface, helping in the anchoring of the pond liner. There are no marginal shelves in our pond liners because of the pond's size. We want to give you the most gallons of water displacement possible, this will help keep the water cooler in the summer and warmer in the winter, and it also provides more air for fish to breath. Marginal shelves in a small pond restrict your water plant location. Without marginal shelves you may put water plants anywhere in the pond by simply placing them on a patio block or inverted clay pot. These liners are light weight and can be folded into a small package, which makes transporting the product easy and shipping relatively inexpensive. 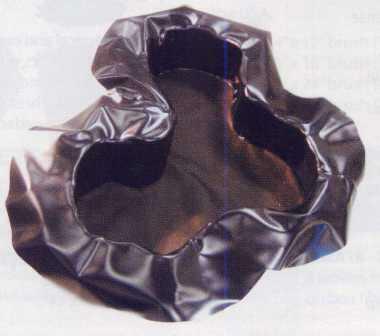 The preformed PVC pond liner because of its c haracteristics it can conform to slight irregularities in pond construction. This makes for an easier installation. Preformed PVC pond liner size 10’ x 6’ x 18” for example will fit into a small box (26” x 20 ” x 6 ”). This makes for easy storage. A retailer can order several styles and sizes taking up a little space. In summary, due to its characteristics, the preformed PVC vinyl pond liner is versatile, convenient, and economical. This liner system is perfect for any backyard or courtyard and can be installed by homeowners. Plus, there's a variety of shapes and sizes to fit every need and budget. This Liner includes a pre-shaped geo-membrane BLACK PVC 30 mil. liner, an underlayment template to insure a professional look with easy to follow instructions. The template makes finding the right location and digging out the design easy - you just mark out the template and follow the inside perimeter. The top of the pond has a collar that follows the contour of the bottom, which makes the collar lay flat on the ground surface, helping in the anchoring of the pond liner. Standard depth is 18". 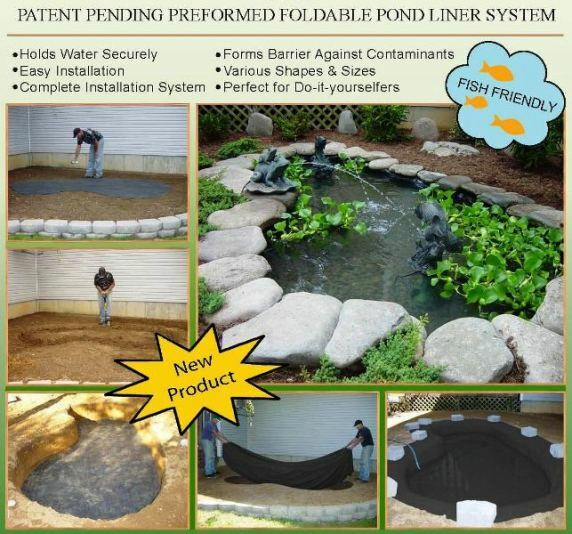 Some Pond Liners also have custom walls sizes available in 24", & 36"Depths. See each description for available sizes. The Pre-Formed Foldable Pond Liner System comes in a box which fits in the trunk of a car. All Ornamental Pond Liner systems are backed with a Fifteen Year Limited Warrantee on workmanship & material. 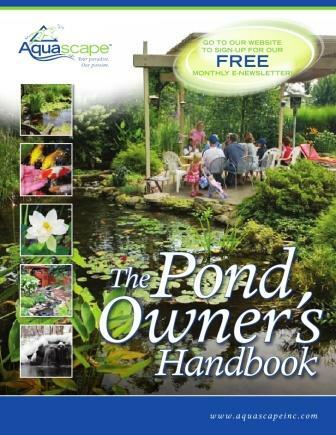 Featuring a Pre-Formed Foldable Pond Liner System. 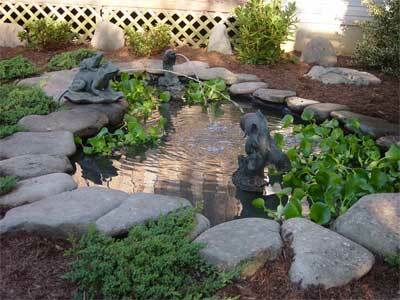 Included pond shaped template serves dual purpose as pond underlayment.